Distributor: Currently licensed by Discotek Media, as well as available for streaming on Hulu. Notes: As this movie assumes knowledge of the Card Captor Sakura TV series, there may be some spoilers in here, though I'll try to avoid them as much as possible. There is an edited version of this movie, called CardCaptors the Movie, which is to be considered redundant as the full version of the movie includes an English dub. Sakura wins a trip to Hong Kong in a prize raffle, so she takes Tomoyo, Touya, and Yukito with her to have some fun. Of course, whom should she run into but her rival, Li Shaolan (naturally, because he's from there!) and his constant companion (and cousin) Meiling? She meets his family, including his four very girly teenage sisters, and his beautiful and perceptive mother. Of course, maybe that raffle win may not have been just chance after all...as the trip to Hong Kong turns out not to be all fun and games. Premonitions and encounters with two strange birds lead to an unexpected magical showdown with a mysterious figure who has been apparently lying in wait for the possessor of the Clow Cards...and how will Sakura fare against this sinister new challenge? 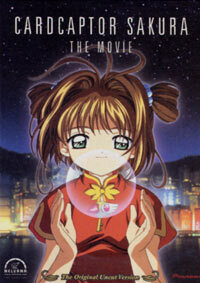 Though not really a stand-alone movie, as it requires at least foreknowledge of the relationships between the various characters, Card Captor Sakura the Movie succeeds in taking the essence of the series, and putting it in wonderful fashion onto the big screen, without compromising anything in the bargain. The first time I was able to view this was as a recently released, unsubtitled Japanese tape - but I had no trouble at all tuning into this. All the wonder and charm of the television series is here, and interestingly enough (though not surprisingly for a CLAMP title), there is a sense of suspense and atmosphere that is really well done, and crescendos into a climax that proved resoundingly that throwing a high budget at CCS is actually quite a good idea. Mind you, if you're deathly allergic to shoujo, or magical girls, or "cute" in general, you won't be able to just sit there and watch the pretty pictures. (Go watch Spriggan.) This show is essentially (and always has been) about the trials and tribulations of Sakura herself, both as the Card Captor, sealer of the Clow Cards, and as a young girl not quite ready to be a woman. It's not just about flash and style (though it has plenty of it), but it's not so serious you won't enjoy it. And thank goodness they didn't dumb anything down (like, say, the Ranma movies). Newbies would best be served watching the Card Captor Sakura TV series first (not that it's such a bad thing!) but those who know and love the characters of this show simply must see this movie. It is, quite simply, everything that a Card Captor Sakura movie should be - and more! Recommended Audience: Very little objectionable content. There is some violence, and the atmosphere is a bit darker than the TV series, though not much more so than, say, the episode with the Illusion card. Children about Sakura's age and older (late elementary or so) would love this, and their parents would appreciate it too (unless they have trouble with the whole aspect of using cards to summon magic spells). Recommended family viewing for the open-minded.